There are only two other guests: Dana Steele, a librarian, and Zoe McCourt, a single mother. On the surface, it seems the women have nothing in common, until their mysterious hosts tell them a story—and offer them a challenge. Legend has it that the souls of three demigoddesses—one an artist, one a bard, and one a warrior—have been locked in a box that has three keys. Now it’s up to Malory and the others to find the keys. Their reward: a million dollars each. It all seems too bizarre to be true. But none of them can ignore the financial windfall they stand to gain. And now Malory—with her soul of an artist and eye for beauty—must find her key first. She soon discovers that whatever locked the souls away is dark, powerful, and greedy…and it doesn’t want the women to win." 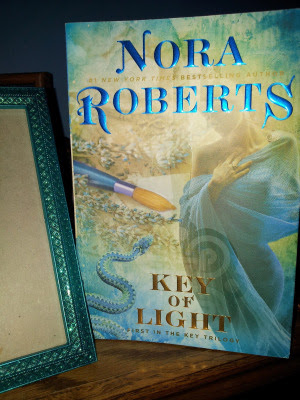 Drawn by the blue cover, deckle edges, and French flaps; I had to grab this Nora Roberts read. Oh, and the sudden impulse for a little romance did its job calling me. Nonetheless, the premise seemed exciting as well. Though I’d hoped the subject of mythical keys and demigoddess wasn’t so literally in its context. That’s right, this is a supernaturally decorated romance novel. And first in Roberts’s Key Trilogy. For me to elaborate, Malory Price worked as an art gallery manager on the brink of termination. She has a temper, and expressed as much to the gallery owner's wife. Malory smothered her passion for recognizing the beauty in art. And toyed with her dreams of owning her own gallery. These were the pieces that drove and supplied her the energy to argue her abilities, as well as express her frustration. In a sense, she took her anger out on others because of her feelings of restraint. Nevertheless, art and her dreams were her focus. While other areas of her life seemed left behind. On the other hand, her romantic partner, Flynn, found himself in charge of the local newspaper, Dispatch. The job fell into his lap when the previous owner–his mother–decided to move out of state. As Flynn's step-father's health declined, his mother felt a relocation was in order. And Flynn's resentment for his mother runs deep. In the meantime, Flynn's left arguing with his distrustful staff, while struggling with his previous girlfriend's abrupt abandonment. She left him for New York, seeing how he wouldn't give up his mother's company to follow her. So as character, he radiated over Malory. It’s when Malory and Flynn come together to speak (or beef) over their romantic motivations, goals, and dreams that I found them mostly irritating. And to be honest, a lot of that stemmed from Malory’s need to be in control. And control she does. However, she has little to hand to a vulnerable Flynn (or the reader) regarding her family and relationship history. As well as the broader things that made her character tick. Whereas Flynn had everything to give to shape the push and pull of their developing relationship. Malory's story, while interesting, surrounded only her career. And it was great watching the fire in the eyes. However, to me, this left her felt vacant and unbalanced in comparison to Flynn. Had Roberts's delved into her backstory, I would consider them equals for romance. At the end of the day, Key of Light was a light, fun, romantic read. And I can’t wait to go further in the trilogy, as Roberts takes us into the budding romance of the next pair of characters.